The era of mobile apps has enabled smartphones in ways that were never imagined. And the proliferation of technology into the hands of the masses has led companies to develop apps that are convenient, useful, and time-saving. Intellectsoft company, for example, has developed over 300 custom projects and perhaps you’re using one of their product at the moment. However, more often than not, really functional and bug-free applications usually cost you a dime, and there are hundreds of free apps that will cause more confusion than convenience. So, whether you’re a user that is constantly on the move, or confined to a desk or sofa, here’s 15 of the best free mobile apps that you can install on your phone to lead a more productive and convenient lifestyle. And while free apps don’t always make the cut, these cool apps are definitely worth downloading onto your Android, Apple, Windows or Blackberry smartphone. Also you can check other our post that might be useful for you – 15 Best Free Website Builders. This mobile app hardly requires any introduction, with over 800 million downloads and 600 million active users; WhatsApp has changed the way we IM. Childishly easy to install & setup, and with an automatic phone contacts sync option, WhatsApp is the most popular feature-packed and ad-free instant messaging. The app allows users to send messages, voice notes, images and videos for free, through an active internet connection. More recently, the WhatsApp call feature has enabled users to speak freely over VoIP. WhatsApp is free to use for the first year, although the company has be generously extending subscriptions for some time now, and its rising popularity caused it to be acquired by Facebook in 2014! Any.Do is the perfect app for those who are highly-organized or borderline OCD. The app is a serious scheduler and daily task-management app that has evolved from its humble beginnings as a simple list-making app. Today’s Any.Do software can do everything from schedule your meetings and appointments, to setting up daily or weekly grocery lists. The most unique feature of this app is the “Any.Do moment”, an option that quickly scrolls through your tasks for the day, allowing you to decide which one you’re going to complete first. Avast! Is a mobile security & antivirus app that has everything you would ever want from an Android security suite, save for an actual security guard watching your phone. Avast has been a long time contender in the free computer antivirus market, and has been one of the best free security software in the world. Its portability as a mobile app has made it a strong contender; unfortunately, it’s only available on Android. Not only does the app comes with high-level protection against viruses, spyware and malware but can even prevent remote tracking, phishing, locking and lost phone tracking. Pageonce is probably the most comprehensive organizer-based app in the market today, acting more like a dotting personal assistant than any anything else. Available across all platforms, iPhone to BlackBerry for a free two-week trial, Pageonce is one of the most well designed apps that allows users to keep track of everything they do, and when they should do it. Pageonce isn’t just a work-organizer, but a life organizer, allowing users to keep track of everything from the balance in their checking accounts, to the status of an incoming courier package; all this through a simple interface. One of the World’s first cross-platform note-taking applications, Evernote is the benchmark that all subsequent note-taking apps aspire to become. Evernote is easy to use and comes with a host of power search features, geo-tagging capabilities and a built-in optical character recognition feature. Evernote allows users to easily store, organize and find their notes. Free to download across all platforms, Evernote comes with 60MB worth of uploads per month. The paid version can cost you up to $45 a year. Another massively popular mobile app, Viber allows you to send and receive texts, images, and videos to multiple users for free. Yes, there are probably hundreds of apps that offer such services, but what makes Viber stand out is seamless ability to switch between video calls on your smartphone, on to your computer. The icing on the cake, however, is the fact that it allows users to keep in touch with family and loved ones overseas, for free. Slacker Radio is one of those rare apps that is both functional, yet lots of fun, and has already become a favorite among users that love streaming music on their computer. Slacker Radio provides users with one of the most unique music experiences that one could get from a free app. The app features a ton of live radio stations, and also hosts a lot of niche content. Apart from loads of music stations to listen to, Slacker Radio also hosts a number of news, fashion, and sports stations. 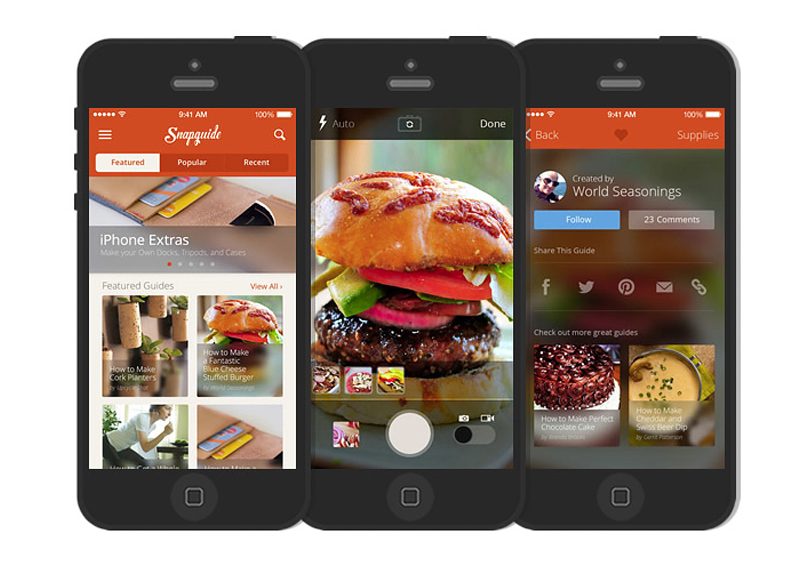 SnapGuide has emerged as the most interactive, and useful crowd-sourced how to application in the world. The app allows users to learn everything from baking to plumbing. The app contains dedicated sections to for cooking, repairs, recipes and even life hacks! And for those who don’t like to read, the app features a number of detailed guides that feature descriptive page photo. And since all the content is crowd-sourced, most users are actively engaged on the site, commenting, liking and sharing guides with each other. With over 100 million active users every month, Shazam is the go to app for people who need to identify music, or get the lyrics to a song that they can’t get out of their head. The app is the first of its kind, and the original name-that-tune app before SoundHound and Google Sound Search. Users can use the app to identify, and tag a song that is playing in the background. Earlier restricted with a bug-ridden interface, the recently redesigned Shazam app is both simple and effective, giving this functional app the attractive package that it needs. The DuoLingo app is an innovative free app that allows users to learn a new language via an interactive and engaging learning process. The app also provides free language translation services into an interactive game! Offering courses in the every major world language, from English to German in the form of timed quizzes, Pictionary, and listening and speaking exercises. The app is chock-full of activities and mini-games that will help you learn a new language while having loads of fun. WebMD is a renowned website that provides users with a plethora of medical information and utilities, right from self-diagnosis to lifestyle changes. And the WebMD mobile app gives users a free mobile platform that helps them to seek quick remedies, professional help, and even features a Symptom Checker that allows users to learn about potential illnesses that they might be suffering from. The WebMD mobile app also features range of healthy living blog articles that are presented in a magazine style, mobile friendly format. Yes, you can access Facebook from Safari or Chrome or any other browser on practically operating system. But nothing can really compare to the seamless experience of using a dedicated app. And Facebook’s official mobile app gives users the functionality of the desktop version on a mobile platform, with an interface that is optimized for smartphones and tablets. The Facebook app allows users to send chat messages in a convenient IM style format, and also allows you to keep in touch with friends and family, and like & share status updates, photos and videos on the go. Instagram is a mobile app that allows users to click pictures, instantly add filters and publish them on their profile. Instagram was the first of its kind social networking app dedicated to images, and with over 250 million active users, it is also the most popular! Instagram also has sharing features such as dedicated Facebook and Twitter share buttons. And with its simple and straightforward interface, Instagram allows users to modify their images with any filter that suits their mood. Mint.com may be one of the world’s most popular personal finance tracking solutions, and the Mint app has given users the power to track their finances on the go. This dedicated app allows users to track and manage their finances and expenses in a simple yet comprehensive manner. It allows users to track their checking, credit or debit cards, and any other payment or transaction gateway. A useful function of Mint is that it sends you reminder about upcoming bill payments and card due dates, avoiding late fee payments. oogle translate is by far the most popular language translation software in use today, and with good reason. It allows users to translate words and phrases by typing in or simply dictating the words to the software. The app is as simple as feeding in the words you want translated and getting the translation! Google Translate is consistently being improved, with things like automatic visual translation of signs and hands-free audio translation in the pipeline.